NORTH ANDOVER, Mass. - The 17th-ranked Merrimack College men's ice hockey team suffered its first setback of the 2015-16 season on Saturday night, as the Warriors dropped a 4-2 decision against visiting New Hampshire at Lawler Rink. Location: Lawler Rink | North Andover, Mass. Bidding for an undefeated month of October, Merrimack welcomed UNH to campus to cap off a two-game homestand a night after defeating Boston University in front of a sellout crowd. The Wildcats, however, took the wind out from under the hosts' sails after scoring twice in an 18-second span in the third minute of regulation; Ara Nazarian lit the lamp at 2:18 before Richard Boyd doubled the lead at 2:36. Merrimack's top line got one back five minutes later, as senior Brian Christie (West Chester, Pa.) netted his third of the year after following up on his own rebound. Linemates Ben Bahe (Stillwater, Minn.) and Justin Hussar (Lancaster, N.Y.) both helped set up the play to get the Warriors to within one. Just 49 seconds into the second period, Merrimack's penalty kill finally yielded its first goal of the season after turning away its first 20 attempts, as Andrew Poturalski buried a one-timer off a centering feed from the bottom of the near circle to make it a 3-1 game. Merrimack appeared to get within one later in the second after sophomore Jace Hennig (Port Moody, British Columbia) sent a loose puck into the net following a scrum in front of UNH goaltender Adam Clark, but the goal was disallowed after the officials ruled that Clark was interfered with. Poturalski upped the ante to two for the visitors just 2:38 into the third, again on the power play, after teeing up a shot from the right point that went untouched into the low-left corner of the net to make it a 4-1 affair. 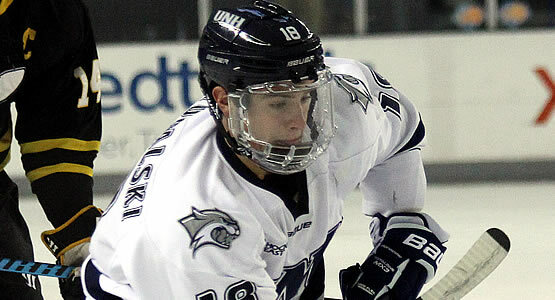 Midway through the third, a UNH turnover led to Merrimack's second goal, as sophomore Brett Seney (London, Ontario) hopped on a loose puck behind the net and fed classmate Mathieu Tibbet (Dover, Del.) for an easy one-time goal to cut the deficit in half at 11:16 of the final frame. That score would hold the rest of the way, as the Warriors fell for the first time this season. Merrimack visits the first of two Atlantic Hockey Association (AHA) opponents on Wednesday (Nov. 4) when it travels to Watertown to face Bentley. Puck drop is set for 7 p.m.